Look at what we have here. The FCC just dropped a little Christmas present for Magenta fans, confirming our original post regarding a T-Mobile MiFi from earlier this week. 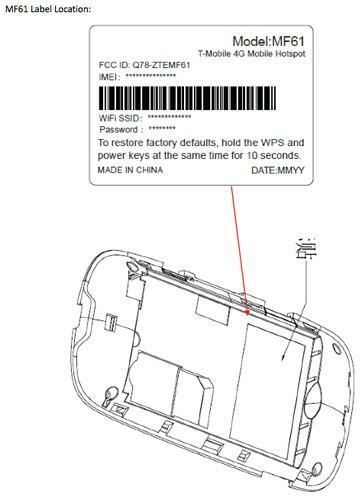 The FCC document reveals the device is manufactured by the Chinese based ZTE, and the device is labeled “T-Mobile 4G Mobile Hotspot”. So yeah, its definitely a lock for Magenta. No other info was revealed, but according to our original document, you can expect T-Mobile’s first MiFi to debut sometime in March of next year. Leave your thoughts in the comments! ← T-Mobile To Release 7? Dell Tablet Known As Dell Streak 7? This will be a wonderful step for our Magenta. I will be looking forward to this! Interesting. With more and more high end TMobile phones having hotspur ability not sure who would need a dedicated separate mifi. Business purposes yeah I can see that. Consumer maybe not. Thats awsome! Way to stay in the game TMO! Wonder what the rapes err I mean rates are gonna be. That’s great for Tmo.. but i have a Android phone, so im covered already.. thx Google! I have a Nexus S that does this out of the box, thanks Google. Even If the Nexus S or the Vibrant do not have HSPA+, they are still extremely fast, I have a vibrant and I am continuously pulling a 4.5 – 5.5 MBPS download speed. It may not be HSPA+ but still fast as hell. im so excited.. i work for tmobile and im so excited to hear this, for customers and my self,! it will be a great seller! No MiFi provider has had the brains to price their product properly. They all price it at the same as vastly higher speed cable, as if the “portability” aspect has some mysterious added value. It does not for 99% of people. A smart MiFi provider would undercut cable by pricing at 1/3 to 1/2 of cable, and take home customers away from that market.The one partial exception is the Clear iSpot for $25/mo, but it’s crippled by being tied to iOS devices only, a minuscule and shrinking segment of the total cable market. (And a not large anymore and shrinking segment of the mobile market.) Clear, like the others, want to nail you a price equivalent to your vastly higher speed cable connection if you want to use it with non-iOS devices. Where’s Virgin? They will have the brains to go after the MiFi market correctly. I have to agree with you on this. Most people after the new wears off on this will only use it 3-6 times a month, excluding buisness people and such that carry their laptop with them everywhere and don’t have a phone with this built-in. For most it wouldn’t be cost effective to pay $40-$50 a month for something like this. Now if they offer a second plan at say $20 a month for those people then they might sell more of these MiFi units and everyone will be happy. Im with you 100 TyroneJ. It is not as fast as cable and the “cap” is about 50x smaller than cable so why would I pay as much as cable just to… move my router around the house? Maybe take it with my down the street-no wait my friends have internet already, take it to McDonalds, a library, or a cofee joint-oh no wait those spots all have internet already. Not if HSPA+42 costs as much as cable then its all good but not the current stuff. Here is the problem, these 5 gb caps are not gonna serve the need for home internet replacement. they are giving the speed but not the data. I can see a miFi device as being useful for families with multiple devices (who want a dedicated hot spot) but with the caps it is really useless. $40 a month and a 5gb cap to the service is what is gonna cause this to fail. The cable companies have done a great job at bundling there products so you “save” money, wireless still treats it as an addon. they are tip-toeing into the potentials but not going after it. EVERYONE HAS A 5GB CAP …GET OVER IT ALREADY…its not meant to replace a home connection, ITS ******MOBILE****** BROADBAND NOT CABLE OR DSL and again tmo is giving the service at 39.99 for existing customer which is at least $15 cheaper than ANY *****WIRELESS**** PROVIDER. Uh? no they don’t, I have a MIFI from Virgin Mobile, $40/mo unlimited, and it works fantastic! The best part about this being a “Virgin Mobile” product? in remote areas of the USA! Check it out at Walmart, $150. Sometimes, its a good strategy NOT to have all your eggs in one basket! wait guys iss this a phone>??? or router? This is a router, a 4G hotspot mifi router. Slider is absolutely right….the wireless carriers are treating this like an addon and are tip toeing around the product. The cable companies planned this right and bundle it in with cable and telephone to make the overall cost of telecomm in your house very affordable. I am trying to sell this product the best I can and I have success with “right fitting” my customers to there needs not wants. Reps cannot push a $40 a month product on someone when they already have cable internet at home and have internet on their smart phones. How much internet does one need? I also heard some reps that tell customers to cancel their internet from their cable provider…huh?? Also after the “honeymoon” of wireless internet whether it be the Dell Mini or Webstick is over, the customer generally uses this product about 2-3 times a month….for $40?? I use my webstick only when I go on vacation and thats for a week out of the year. I never take my laptop outside and I see alot of customers doing the same. What is this big push of MBB? why is it that every weekend is a MBB weekend? how about stop pushing the reps to sell MBB and let them “right fit” the customer like they do on every other product they carry and if you sell one…GREAT!! who even cares about a tmobile hotspot? 5GB cap is useless in this day and age unless you’re using a mobile hotspot to browse forums on your laptop – which is…well a genuine waste of money if nothing else. And to the people that think everyone has a cap…sprint doesn’t.